This design studio hires people with or without intellectual disabilities. His model has been exemplified by the UN and inspired the 'Special Olympics' to shoot a documentary. There’s a design studio in Barcelona, ‘La Casa de Carlota’, which without it has the intention has become a world example of inclusive for the UN and for the movement Special Olympics' International. The Casa de Carlota hires artists with or without intellectual disabilities to create unique and innovative designs for products and services. The studio offers avant-garde design to its customers thanks to the abilities of artists who work on projects for high-level clients. "We are not a work reintegration program. Everyone who works here is for his talent. People have been chosen and we work together with the ‘Fundació Aura’, "says Sergi Capell, one of the study partners. Add: "We are the only design studio in the world that incorporates to work people with intellectual disabilities." 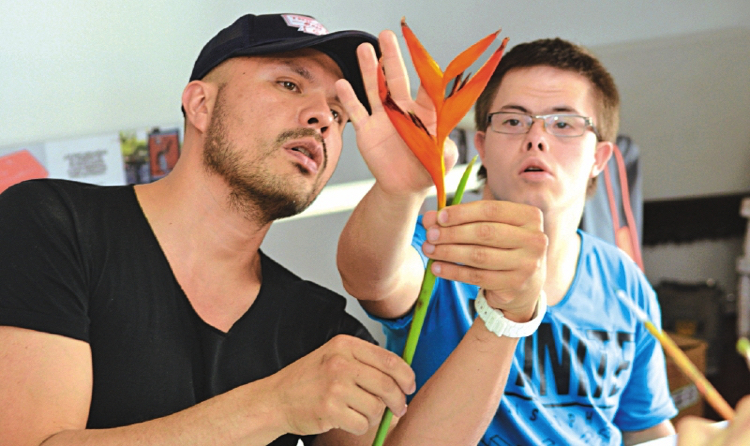 The Fundació Aura is dedicated to improving the quality of life of people with intellectual disabilities through social and labor inclusion following the methodology of ‘Work with Support’. A model of labor integration for people with disabilities that began to develop in the 80's in the United States. This model facilitates the incorporation into the ordinary work of groups of people with significant physical, psychological or sensory limitations. In this sense, Casa de Carlota applies this model and, for that reason, has been the source of inspiration for the movement of the Special Olympics International to roll a documentary showing an example of the inclusion of this study in Barcelona. The 'Special Olympics' movement not only wants to promote inclusion through sport. It also wants to break the way people have to see people with intellectual disabilities. That is why this international organization has put as an example this design studio in the documentary about the Special Olympics International that will be emitted by the American chain ESPM shortly. This documentary was recorded in May in Barcelona. Special Olympics wants to promote sport in a field that seeks normalization and that's why they fascinated our philosophy of working, "says Capell. But apart from the Special Olympics, La Casa de Carlota, has also been a reference point for the United Nations (UN), which invited partners to present the project at the headquarters of this organization. In addition to this, this study of Barcelona has been one of the creators of the Genuine League, an integrative and pioneering initiative in the world, organized by Laliga through its Foundation, consisting of a football league composed of teams of people with intellectual disabilities. One of the objectives of this initiative is to make all Laliga clubs have their Genuine team.